I've done with making Christmas cards for this year and am planing to tidy away all the seasonal bits and pieces littering my work space. I've made a birthday card for the Pixie Snippets challenge this week for a chance to be included in the draw for the items which Di used to make her super Christmas card - such a fun card and a great detailed explanation of how it was made. For this card I've used up snippets of cream card mainly and also used a snippet from a sheet of card which had been coloured using Pixie Powders (how appropriate is that name?). The large snippet of background paper has been sponged around the edge with Distress ink. The border strip is built up from strips of the various papers/card and the floral border was also cut from the same cream pearl card and stuck behind the straight border. 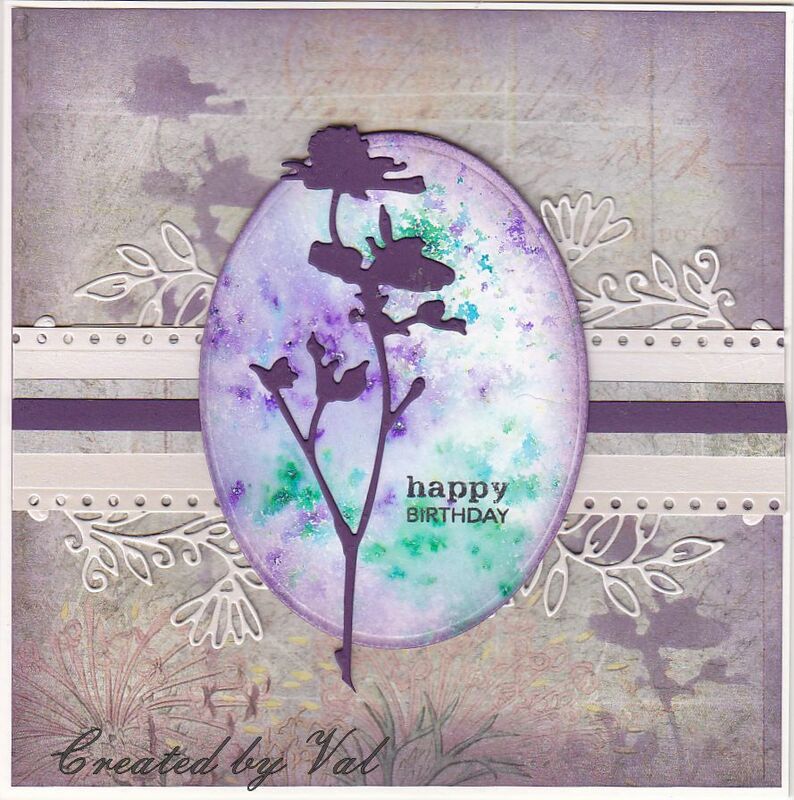 I then found a snippet of purple card to die cut the flower spray, using the 'waste' to sponge a little detail onto the background. An oval was cut from the Pixie powder piece and a tiny greeting stamped using black ink. 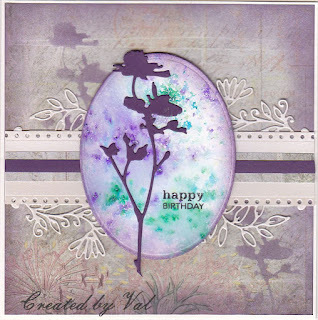 A beautiful card Val, I love all the different dies you've used on the card and the colour too. I love the sound of the pixie powders and love this card. Those colours are so restful. Hugs Mrs A.
I love these colours and you've used so many snippets!